Thanksgiving weekend 2001 we drove up in front of one of the ugliest houses I have ever seen. Bushes were growing over the windows. The yard was filled with debris, including piles of old rusted out vehicles. The siding was faded to a color no one could identify. When we stepped inside the smell of cigarette smoke, mold and mildew was overwhelming. There were rodents and their tracks everywhere. It was filthy. The brown tile flooring, green appliances, layers of busy wallpaper, green baseboard heaters and bifold doors and the blue and green bathroom fixtures all shouted back to 1970 when the house was originally built. Almost as a joke someone had laid brand new beige wall to wall carpeting throughout to make the house "more appealing." After seven years of searching for the perfect place to raise our family, Allen said he was going to buy it. Call it hormones. Call it despair. I wept. Then I packed. We spent the next 4 weeks making the house livable and the many years which have passed building our home. Just about every evening and weekend have found us working on one home improvement project or another. As we have done so our children have learned so many useful life skills. We have all learned to see each others vision and to compromise. Most importantly our hearts have been tied together in the common pursuit of making this something we came to love enormously into something beautiful and a place where we have welcomed our babies, friends, family, neighbors and strangers alike. We added, fixed, painted, hammered, tiled, laid wood floors, hung wainscot, painted cabinets, remodeled bathrooms, dug drains, rewired electricity, built shelves, repaired anything and everything and painted some more. The garage was converted to make room for babies. The basement has been finished and gutted three times. Then there is the pool and my happiest place on earth, the gardens. Through this labor of love and working together, the house which started as my nightmare truly became our dream home. We moved just 9 days before Nathaniel was born. Our first son is 14 now and despite those first minute jitters, we have been enormously happy in this home. We've added five more children and faced every joy and tear imaginable. I can't count the number of holidays, birthdays and parties these wonderful walls have seen. Our house is not large. In fact, by most standards it is pretty tiny. The main floor was only 1200 square feet before we converted the garage. But for us it has always been just the right size for a happy family and to welcome a pretty constant stream of visitors throughout the years. I count some of my happiest moments as a homemaker in the visitors who have come here for rest, in their joy, to share a heartache, find respite, or share in celebrations. Knowing friends will pop in when we aren't home to nap in the family room, drive ten miles out their way to sit in the favorite chair after a long day, or stay at our dining table til midnight despite a 3 am commute, reminds me we have accomplished what we set out to do so long ago. We have regularly hosted groups upward to a hundred people and we always wondered if someone might feel uncomfortable in our closer quarters. However, one friend aptly pointed out it never stopped anyone from coming. And staying. And asking when the next gathering will be. When I was pregnant with Addison it was with very heavy hearts we realized we needed more space for our growing children and for what we hope will be a future of endless growing as we add spouses and grand children and carry out our lifelong dream of adopting. We briefly considered moving but really that was never an option. And since the location of our house prevents us from expanding the footprint any we were left with the only other option... going up. We made the decision and worked with our architect to refine our blueprints. And we were all set to go. And then Addison was born. And our world has been spinning ever since. For three and a half years we prayed for God's will and timing. No time seemed like the right one as we faced different trials with our precious boy. And then, in June of last year the Lord threw every door wide open. And here we are. In the middle of something new and beautiful and wonderful. It has been five months since the exterior was essentially finished and I still find myself surprised every time I turn the corner onto our road and see this big beautiful blue house in place of our little, well loved and very worn rancher. Just before we signed our final papers last summer, we were sitting around the pool listening to the all 80's weekend as I tried to convince the family a move would be a better choice than undertaking still more home improvements. That's when the DJ previewed Bon Jovi's new album. One of my favorite artists from my youth, I turned it up to hear the cover song from This House Is Not For Sale. And really that's all she wrote. Instead of a new adventure in somewhere USA or beyond we knew we were moving into a realm of home improvement greater than even we had experienced before. And we knew there was no taking the easy way out. We would have experts where we needed them, for sure, but we also knew this project would have our stamp on it. Not just to save money, but because that's who we are. We like to get our hands dirty and work together with the radio blaring all day Saturday. And while there have been moments when I think it would be nice to be done with the dust and have a weekend free, we are enjoying the process so much. I am not in any hurry to finish. Because I know once this job is done, it is done. And having fun building memories together as we build our home is a priceless journey. We did hire crews to frame the second floor and get it water tight, remove a bearing wall on the main floor and install new steps and windows, roofing, HVAC, plumbing, siding and pour concrete. We also had a crew install the new chimney and pellet stoves as well as do the stonework and hang and finish drywall. Because we HATE doing drywall. The last of the crews are finishing up their work, HVAC, the stone foundation and the decks, in the next few weeks and then we will be on our own to finish the second floor and move up before the crews come back to start work on the first floor renovation. Which brings me to one of the biggest blessings of this project: getting to know all the different contractors, learning about their families and hearing tales of construction projects over lunch each day. We haven't done nearly as much school as I had initially hoped but I wouldn't trade a whole school year for what the kids have gained both through their talks with our workers or the skills they have taught them along the way. And I hope that through the time we have spent with our workers they have also gained blessings. We have loved seeing progress each day as we learn new skills and put all those ones we learned over the years to work. For our part the kids ran most of the electric with Allen's direction. They did all the painting. In the bathrooms they set tubs, laid heated floors, tiled the floors and the showers and tiled the laundry room. In a few weeks we will be setting the master bath and installing sinks and toilets. Allen has installed all the baseboards, wainscot, chair rail and crown moldings as well as doors. The kids have installed lights and ceiling fans and the whole team is working together to install the hardwood floors. My main job is researching, making design decisions and grilling contractors. Oh, and keeping everyone fed and the youngers out of trouble. Along the way we have continued to live life in an even bigger way, traveling one week out of every month for Addison's therapy in addition to his regular weekly therapy meetings and daily therapy. Brianna has completed two college semesters. The seven oldest have kept up with their school studies and music lessons. We have helped start a new church and hosted a weekly small group. There were driving tests, out of town guests, weddings, funerals, and countless dinner parties. There has been sickness (this was a very hard winter for us), disasters (failed septic, a dry well and an entire rebuild on our water system) and a basement flood from the septic which required an entire basement gut and rebuild two weeks before Thanksgiving. Addison has learned to walk, potty trained, started talking and come so massively far in eating it is hard to believe he is the same kiddo from last May. So yep. The last nine months have been a big, loud, messy, stressful blast. And we ache at the end of every day. And we are tired. So very tired. But every one here agrees we are grateful we decided this. house. is. not. for. sale. What an amazing adventure! 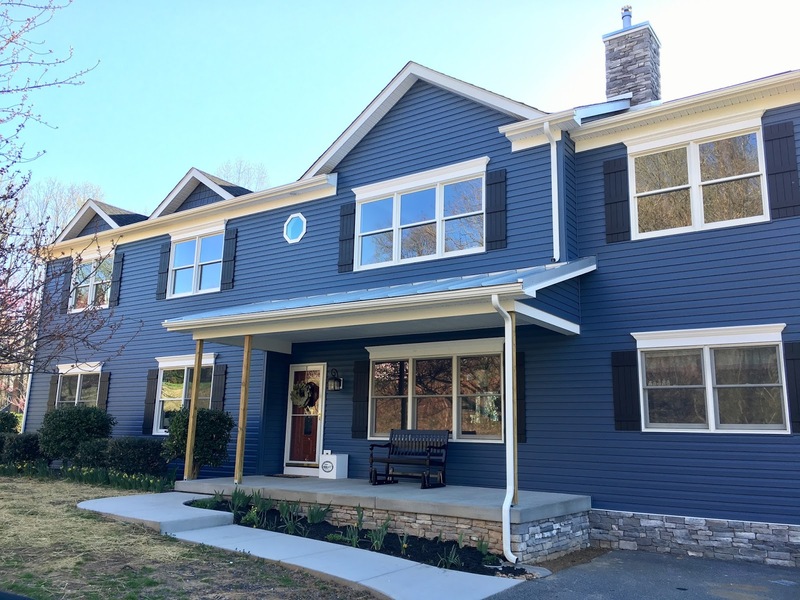 The house looks amazing on the outside (I LOVE the bold color choice), and I'm excited to see pictures of the inside.